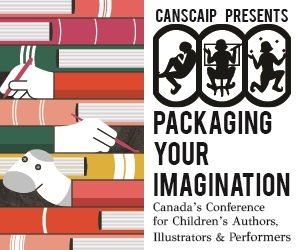 CANSCAIP is proud to partner with the Humber School of Creative and Performing Arts to deliver Virtual Packaging Your Imagination 2015 via Blackboard Collaborate. Virtual PYI is live-streamed to your computer in real time, for an experience that is almost as good as being there. Virtual PYI participants can even send questions to the speaker during the Q&A. Virtual PYI participants receive clear and simple directions for access. Not much of a techie? If you know how to Google search, follow links, and open emailed attachments, you have the know-how to participate in Virtual PYI. To facilitate the live-streaming of Virtual PYI, the conference speakers wear lapel microphones, and high-quality video cameras follow their presentations. Speakers' visuals are uploaded ahead of time and pre-tested for Virtual PYI. A dedicated Virtual PYI moderator monitors the virtual delivery of each session. If you have any questions or problems, let the moderator know and they will respond immediately. When Virtual PYI participants send questions for the speaker, the moderator asks the speaker that question. In 2014, the Virtual PYI experience was seamless with excellent reception quality and great participant feedback. This exciting option will be even better in 2015. Refunds with a cancellation fee of $45 until Friday, October 18. We regret no refunds can be offered after that date.